I received a copy of this book in return for an honest review, my thanks to NetGalley and the publisher. I admit, sometimes I’m pretty shallow when it comes to picking a book to read. I judge by the covers (both the front and the back). 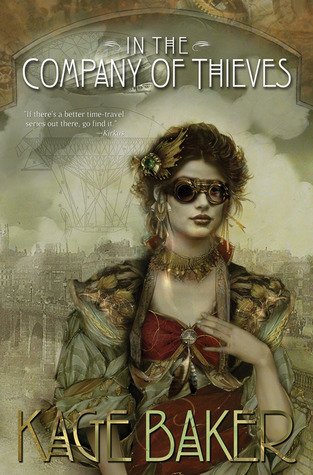 The cover to ‘In the Company of Thieves’ pulled at me and I just knew that I had to read it. I was sad to learn that Kage Baker had passed on, and even sadder once I read the first short story in this series. It involves a robotic entity who does nothing but observe time as it passes. Down the same streets, the same city. Eventually he starts to watch and observe a woman who visits a specific park each day. She fights for the restoration of the park but no one listens to her. He watches as she becomes thinner, and thinner, and eventually she dies from her illness. It was a sad yet touching story, filled with emotion and compassion, more so once I heard of the authors own death. Funny how things can touch us that way. The stories were chosen by the authors sister once she had passed on, and that is probably the reason why they seem to ‘hit home’ as it were. There are six short stories total and while the later ones involve a setting that Kage Baker is known for, the first ones are a bit all over the place. This isn’t a bad thing, it just left me a bit confused as I naturally looked for a tie-in between stories. I loved the writing style and the steampunk-esc settings, but still found myself wanting a bit ‘more’ out of each short story. The book came out in 2013, so if you’re a fan of Kage Baker or are looking for some new short stories to delve into, this makes for a great choice and it certainly left me with the desire to check out some of her other work.